Founded in 1892, Royal West Norfolk Golf Club is a classic, nothing much has changed here for 100 years. Squeezed beautifully between Brancaster Bay and the salt marshes, Royal West Norfolk truly is a peaceful golf links, except when the wind blows and boy, is the wind bracing here! Check the tide times before you plan your trip to Royal West Norfolk Golf Club. The course plays on a narrow strip of links-land which gets cut off at high tide, turning it into an island. If you are lucky enough to play the course during high tide, you are in for a real treat; the downside is that you will need plenty of golf balls. Prior to your game, grab a quick drink in the oak-panelled Smoke Room inside the Victorian clubhouse and check the wind speed on the gauge next to the bar. If you want to eat after your round, make sure you order before you play, otherwise you will only be offered a choice of delicious cakes. Out on the course, you feel delightfully isolated; often all you can hear are the seductive sounds of the wind, the seagulls, the clinking of stays and the flapping of boat sails. Essentially, the course is a traditional out and back links; huge sleeper-faced bunkers, fast greens and that beautiful links turf. A magical place to play golf. However, three-ball play is only allowed at the discretion of the Secretary and four-ball play is forbidden. Beware the weather at Brancaster though; it can take you by surprise. We played here in late spring and ignored the black clouds to the west. After all, we were on the 15th and the sun was shining. By the time we reached the 17th it was raining and by the 18th, we faced a full-blown tempest. When, soaked to the skin, we arrived to knowing smiles in the clubhouse, the wind gauge was fluctuating between 50 and 55mph. Just to set the scene I played Royal West Norfolk (Brancaster) in the final throws of the UK summer after the hottest day for 50 years or so and the temperature was about 25 degrees on the coast and nudging 30 inland. There was always wind off the sea, slightly behind on the back 9 and from the right (the sea). A couple of times this probably approached 2 club strength. I play off 12 and shot +10. Having been to the beach a few times with my dog I had always wanted to play Brancaster to see what all the fuss was about. How special can a flat(ish) piece of land be in Norfolk? Well, very special is the answer. The whole aura of the place is magical, from the clubhouse which clearly hasn't changed in 100 years to the huge iron gates which both welcome and intimidate you onto the course. There are many quirky features here but my favourite one is having to push your trolley full with the latest advances in golf technology over a 20 yard strip of deep sand which forms the entrance to the beach. You get a few curious looks from the holiday makers before you enter through the gate, shut out the modern world behind you and step onto the land that time forgot. There is a small practice putting green and a net to have a quick warm up. This is all that the place needs to be honest, golf seems to be played here for enjoyment and the scoring a bit of an after thought. A row of lycra clad athletes pounding balls down a range just wouldn't look right here. If you take a few shots to get into the round then who cares just have a look around you and soak it all in. the 15ft deep bunker on the left edge of the green so ended up in here. The sand in all the bunkers is excellent so providing you have a decent bunker technique, although daunting, these can all be navigated fairly well. As has been mentioned nearly all of the bunkers have wooden faces which is beautiful on the eye and gets your heart racing a bit when your ball is bounding anywhere near one. I won't bore you with a blow by blow account of my round any more but I would say holes 8 and 9 and 14 and 15 are worth the entrance fee alone. Hole 9 is the best par 4 I have ever played with a second shot approaching 170 yards (all carry to a wide narrow green jacked up on wooden sleepers). Oh and that is into the wind. There are a great mixture of holes here, and I can remember the details of nearly every one, a sure sign of a wonderful course. The members are all really friendly and welcoming, as are all the staff (there are no more than a handful) and the whole experience is second to none. I can't compare it to a vast array of links courses but it is head and shoulders above Sheringham along the coast which is in its own right a great course. There is just something about this place you can't quite put your finger on. Cost isn't something I usually factor in when playing the really nice courses but at £85 I'd say this is good value, especially when the food and drink post round is so cheap. P.S This place must be absolutely brutal in the winter but I would love to give it a go! Royal West Norfolk is a testing yet incredibly fun layout to play. This can be put down to both the variety and number of quality golf holes it possesses. While the course stretches to 6,457 yards from the tips, its difficulty is largely due to the combination of narrow fairways, deep bunkers, smallish greens and its coastal location, meaning that the air is never still for too long. The bunkering at Royal West Norfolk is a unique aspect of the course, with timber sleepers employed to form the banks (or walls) of the majority of bunkers throughout the layout. This is actually the first time I've encountered bunkers constructed in this method, and I must say that they fit with the character of the layout and its setting exceptionally well, adding to the many charms of the course. Several bunkers throughout the course are very deep and therefore quite punishing, so it’s best to give them a wide berth to avoid piling up a big total. The most menacing would have to be the cross bunker on the par three 15th, which by my estimates approaches a height of some twenty to twenty-five feet. It is one of several instances where bunkers are set directly across the front of the green they are guarding, thus creating a forced carry to reach the putting surface. While there are many fine holes to pick from, there are three stretches in particular that I find most endearing, these being 3-5, 7-9 and 11-14. Of these ten holes, the most well-known (and photographed) would be the par five 8th and par four 9th holes, which both ask for heroic shots over the tidal marsh from the tee, and again for the approach shot into their respective green. Playing these holes when the tide is in not only adds to the their beauty, but also ratchets up the intimidation factor significantly. This is especially true on the 8th hole, where at high-tide the first portion of fairway effectively becoming an island! Two other personal favourites include the 129 yard par three 4th and the 430 yard par four 14th. At the short 4th a wall of timber sleepers to the bank fronting the green dictates that your tee shot must carry all the way the putting surface. Three deep pot bunkers sit precariously below this wall to gather up any tee shots that fail to clear the timber, making an uphill recovery shot to the blind putting surface from this area that much more difficult. Tucked just below the foredune, the 14th is a slight dog-leg left to right with the tee shot played into an open fairway. Despite the lack of fairway bunkers to trouble your tee shot, there is little room for error with thick rough bordering both sides of the hole. The blind approach is then played to a narrow, slightly sunken green, hidden from view behind a small ridge. Decorating the right-hand side of this ridge is another wall constructed of timber sleepers, with two small pot bunkers set just below the wall amongst patches of long grass. Despite the visual intimidation of the above elements, should you be successful in clearing them the contouring of the ground will help to guide your ball onto the small, sunken green. There is a distinct lack of signage to guide you around the layout, and so for first time visitors like myself navigating your way can be, at times, slightly confusing. This is especially so when leaving the 5th green, as you must exit the green to the right and cross the 7th fairway approximately 150 yards in front of the tee to reach the 6th tee. However I must admit that this is a small concern in the grand scheme of things. The only real advice you need in getting yourself around will likely come via the staff in the pro shop: "Just aim for the red flags on the way out, and the yellow ones on the way home!" A word of caution: the entry road is often flooded at high tide, cutting off access to the golf course entirely, thereby leaving golfers stranded on either side for up to several hours. It’s therefore highly recommended that you check the tide charts when booking a round at Royal West Norfolk to ensure you don’t miss your tee time. Of course should you find yourself ‘trapped’ on the island, another 18 holes is certainly a fine way to pass the time on a summer’s afternoon…. This review is an edited extract from my Blog titled: An Architect Abroad, which documents an extended golf course research/study tour that I undertook over a four month period from mid June of 2014. The full review can be found at: http://wp.me/p6l5Ih-V along with photographs taken of the course. Please also note that my rating of the course has been done specifically against the other courses that I visited on that trip, many of which rank highly in the top 100 listed on this website for the United Kingdom. The hyperlink in the review should now work. I first saw RWN on my honeymoon in 2006. Doing the walk along the beach thing I decided to pop my head up to have a quick look at the course. It looked bizarre, funny looking bunkers, no one around, unsure of the routing, all up it looked like a bit of a toy golf course. Interesting but not a classic. My ignorance of links golf was startling. I went way and had a look at it on the net and saw that it was well rated. On my next visit (I am from Australia and this RWN experience gave me a love for links that is getting stronger and stronger) I played, caught up with and played with a lovely member, did it again the next day and lo and behold, this course was an instant top 5 and, well one day, it may get displaced (playing Cruden, Roy Aber, Murcar soon) but it was a fantastic experience. An absolute must play for lovers of links. I'm up to 33 links courses played and would love to discuss each and everyone of them. I have plans to play all 249 of them (true links 246 + Covesea + Trump Links + Wick). I reckon Freshwater Bay on IOW and Troon Fullarton might have a place as well? Currently top 5 are St And Old, Western Gailes, Carnoustie, RCP and RWN. Playing them at a rate of about 8 pa so will take a while unless my 12 mnth summer chasing dreams come to fruition. Saving 6 balls for Old and WG so far. They have just a tad on the others. Even though you may have the wind behind you for most of the outward nine, the first three holes are quite demanding, each being a par four in excess of four hundred yards. The par three 4th is only 129 yards but it tends to play longer as it is uphill and often into the sea breeze. The 6th is another par three, but somewhat longer at 184 yards. Your most lasting memory of Royal West Norfolk is probably going to be the area at the far end of the course, featuring the 8th and 9th holes. Eight is rated the hardest on the course, even though it is a par five of only 494 yards. There is a large tidal marsh area in front of the tee, then a strip of land followed by another tidal wetland with fairway recommencing about sixty yards short of the green. 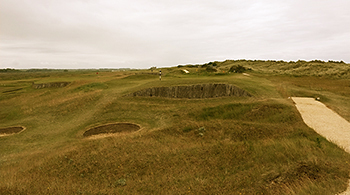 The 9th hole features the frequently photographed green raised up on land supported by sleepers and nearby the sea inlet and numerous yachts moored or just lying on the sand. This is my favourite hole. Tidal marsh land runs along the first part of the fairway on the right. The ideal shot is a fade towards the hazard, followed by well struck mid-iron over another tidal area to the raised green. Royal West Norfolk has history written all over it. The first Captain was none other than Horace Hutchison who had a hand in the design along with Halcombe Ingleby. The greens are excellent, the fairways are lovely crisp turf, the wind is always a factor and there are some brilliant if somewhat quirky holes. I loved every minute of it. This review is an edited extract from Another Journey through the Links, which has been reproduced with David Worley’s kind permission. The author has exclusively rated for us every English course featured in his book. Another Journey through the Links is available for Australian buyers via www.golfbooks.com.au and through Amazon for buyers from other countries. I played Brancaster on a stormy day in late March 2013 and absolutely loved it. It’s everything you’d expect from an excellent links. It definitely has its share of quirk from the par 3 3rd hole to the par 4 9th and its approach over water with a big back drop to the blind approach on the par 5 10th hole. The more I travel and play golf the more I enjoy these features of classic courses that modern architects wouldn’t even consider or perhaps better said get away with designing today. I’m sure the short reachable island fairway par 5 is a favorite of many visitors as it’s quite unique. I found it tough to choose the right club hitting both my driver and 3 wood too far on the wrong line to play the hole effectively in both the morning and afternoon rounds. Maybe next time. The conditioning of the course was excellent, especially right after the winter. Playing fast and firm again exactly as you expect a links to be. Highly recommend adding a visit to any golf itinerary in the area. Recently visited with 3 friends and played 36 holes. What a unique and delightful links course. Everyone we met was very friendly and helpful and we would recommend to anyone who enjoys links golf. We also played Hunstanton which was very good but would rate Royal West Norfolk higher. Brancaster is nothing but old school from the moment you drive across the marsh you are stepping back into time. It is almost like you would expect to find Braid, Ball, Hilton, and or Vardon on the grounds perhaps playing a match with hickory shafts. A day spent here is a special day for any golfer, wearing plus fours here is like a requirement or at least a cap. Thank God there are no four ball matches here that said you better play fast. Stay out of the way of the member foursomes they will run you down. As you play the course you will notice the simplicity of the design yet the course is a real challenge with many excellent holes. So, be sure to make a date at this enjoyable club as it is a must play. The clubhouse is really neat too, they don't build them like this anymore. If the weather is nice bring your dog they are welcomed everywhere. In general golf would be better if they had more clubs and courses like RWN. Along with Prestwick, the most interesting and quirky golf course I have ever played. Make sure you play it at high tide, when the water sweeps into the bay and transforms some fairways and greens into islands. Played the course in mid May the day after Hunstanton. 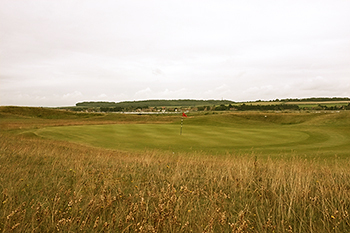 I have seen reviews preferring Hunstanton as a course and golf experience. Hunstanton is good but this course is in another world. RWNGC takes your breath away from the time you drive through the reeds flanking the approach road.. The first 9 holes play away from the clubhouse generally with the benefit of the prevailing wind. The views are extensive across marshland inland and across dunes to the sea. The only sound is generally the whistling of the wind and the sound of club on ball. The enjoyment increases by hole until the 8th is reached which I think to be the best hole I have ever played. A shortish par 5 with an initial drive over marshland to a fairway at a right angle. Then to decide –along the fairway towards a summer house to finish with a short iron or cut the corner over more marshland to the green. Sublime. The 9th is also a classic par 4 requiring an accurate second shot to a raised green fronted by enormous vertical railway sleepers at the bottom of which lies hostile terrain. The back nine plays generally against the wind. The par 3 15th of approximately 180 yards required a driver for most of the party I was with so the extent of the test on the return can be gauged. On days when the wind is up it would take a hearty constitution to want to play the course again in those conditions. All my party found the course more challenging than Hunstanton. All confirmed they would never forget the experience. Downsides? The nature of the soft coverings on the fairways is a surprise and is different in constitution from most links. It is difficult to compress the ball and takes some getting used to. It also looks like the club are erecting a modern construction in the middle of the course which, at this stage, looks a complete eyesore and completely out of character with its surroundings. But seeing how the club has maintained its antiquity in all other areas I suspect there will be a plan ensure that the building does not interfere with the club’'s reputation.